Just a little Friday fun. I love the “DESERT – THIRSTY” part! 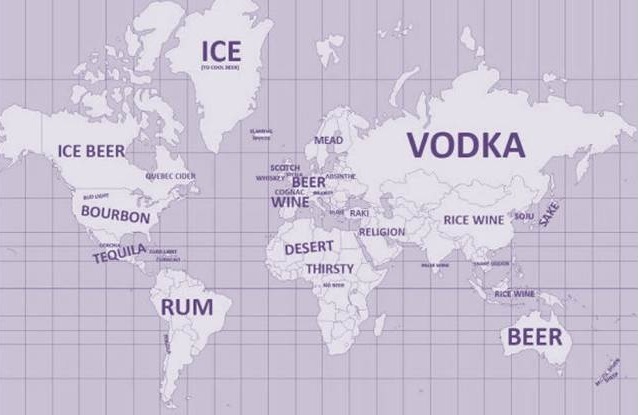 So where would you most want to live based on imbibing? Grapefriend would clearly have to reside in Europe. Tags: beer, bourbon, ice wine, sake, scotch, tequila, vodka, whiskey, wine. Bookmark the permalink. Great fun! Although I don’t think I have had any bourbon in at least 15 years! Oh you are missing out 🙂 Winter is more my bourbon drinking time, though it usually takes a day for me to recover. I think I would have to shuttle in between wine and rum with maybe a bourbon chaser. Mead… hmm I love my wine 🙂 and we do produce some in Scandy as well 😉 Really fun though! cute! Though I’d slip the tequila line up to include southern California. L’ha ribloggato su Delightfully Italy. Very cute! Shared it on my Facebook. I miss the wine in Chile and Argentina and pisco in Peru, but other than that this is how I see the world indeed! Great post guys! Thanks – heading to both Chile and Argentina for some wine drinking next month! Seriously? That’s great! Have fun! I LOVE IT HERE IN THE GOOD’OLE U.S. of A, WITH MY BOURBON!!! That’s fun, we are big beer drinkers here in Australia but we are definitely big wine drinkers too. We have fantastic wineries and beautiful wines. Luckily we are very global in our thinking and have access to and enjoy drinks from all over the world. Cheers!